During a pre-trip check, a truck driver noticed three of his tires were low. After inflating the third tire from 30 psi to 90 psi, it blew off the trailer and struck him in the legs. He suffered soft tissue injuries to both legs as well as back injuries. A worker had taken a wheel off of a loader and noticed the lock ring wasn’t seated properly, so he wheeled the tire to a stand to deflate it. While placing the tire against the stand, it slipped, hit the floor with the lock ring facing downward, and exploded. The worker was struck in the face with dirt from the tire rim. Injuries involving tire explosions or multi-part rim tire failures can be serious, or even fatal. The main hazards are zipper explosions of the tire or a blow off, which is the sudden violent springing of tire lock rings, rims or flanges from the tire assembly. These incidents usually occur during inflation. Never reinflate a tire that has been operated in a run-flat or underinflated condition (80% or less of the recommended pressure). Deflate the tire completely by removing the valve core before demounting. Ensure the valve stem is clear by inserting a wire into it before demounting from the wheel. Demount, inspect and match all tire and rim parts before reinflating. Never use an unidentifiable rim part. Cracked, rusted, worn or corroded rim parts must be replaced. Damaged wheel components must not be modified or welded. Heat must not be applied to a multi-piece rim or wheel. Never repair wheel, tire or rim parts. When rounding out the tube or seating the side/lock ring without a restraining device, never inflate the tire to more than 3 psi. Further inflation could result in an explosive separation. Don’t seat rim components by hammering, heating, striking or forcing them together while the tire is pressurized. If they do not fit, remove and inspect the components and rim gutter for damage, rust or other foreign material. Ensure all rim parts are properly seated before any inflation pressure is added to the tire or tire assembly. Never exceed 35 psi when seating the bead. Use a remote distance clip-on air chuck with an air line pressure gauge or pre-set regulator to ensure the worker is at a safe distance during tire inflation. Never leave an air line unattended when inflating a tire. 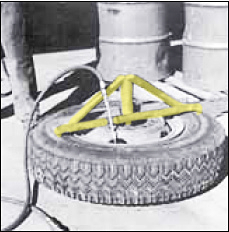 Always inflate tires inside secured restraining devices such as a tire cage, inflation chamber, tire bag or chain. 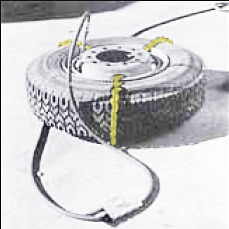 Secure restraining devices so they do not become a trajectory during tire inflation. Do not overload or overinflate a tire. 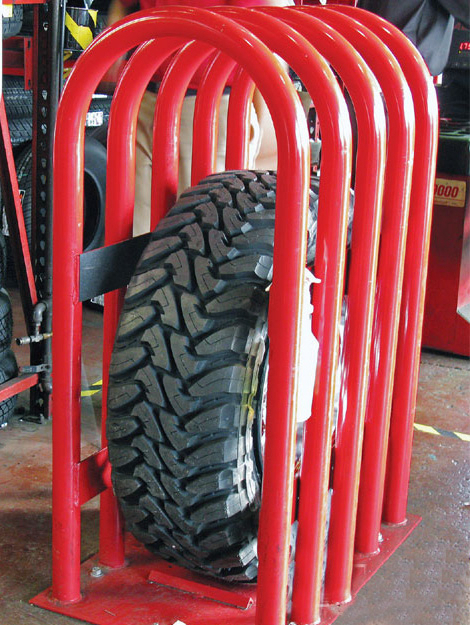 While still within the restraining device, inspect tires and wheels after inflation to ensure they are properly seated and locked. If further adjustment is necessary, deflate the tire by removing the valve core before doing so.